Today many of us begin the seasonal process of identifying and capturing one story per day for the next 25 days or the next month through a project called December Daily®. Some of you will be making daily pages along with me, some of you will just be taking photos, some of you will just be journaling, and some of you will approach this project from an entirely different perspective. Whatever this project needs to be for you this year is how you should approach it. Starting tomorrow I will be sharing my stories each day here on my blog (with a couple exceptions noted below). Embrace your own story. Your story is just that - YOURS - and it matters. My story will be different than your story because we are each living our own lives. You might be in a totally different season of life than me and I want to encourage you to celebrate where you are and look for the joy in your own life. It is there - even in the hardest time it is there. 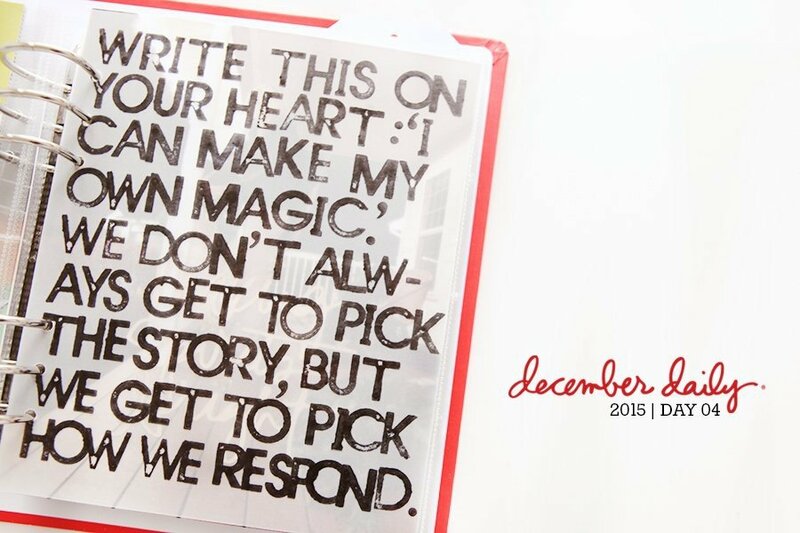 Go read my December Daily® Hopes For You. This is a post from a few years ago that still rings true and is a great reminder to begin the season. Figure out what works for you. There isn't a right or a wrong way to approach this project. That might be taking notes during the month and bringing it all together after the holiday is over. Remember that this project is a part of my job and one of my commitments is sharing my ideas and workflow during the month itself. The sharing of ideas and stories is meant to encourage you rather than frustrate you and make you feel behind. There is no room for guilt here. Let my ideas be jumping off points for your own ideas. Stories don't have to look the same. Stories can be long or short. They can include words or just be a photo. I choose to tell one story per day because that's how I like to approach this project. This year I will be traveling to New York City from December 5th through December 9th and will not have regular blog posts on those days. I will be using the traveler's notebook I created for my December Daily® (you can see that in my Foundation Pages post here) and will share that here on my blog when I return home. I will be sharing bits and pieces of our adventure on my main Instagram account (https://www.instagram.com/aliedwards/) and I'll be sharing what I'm adding to my traveler's notebook on the December Daily® Instagram account (https://www.instagram.com/decemberdaily/). You can follow both of those without having an instagram account via the previous links. Need more encouragement or inspiration? Check out my starting place/Foundation Pages for 2018. 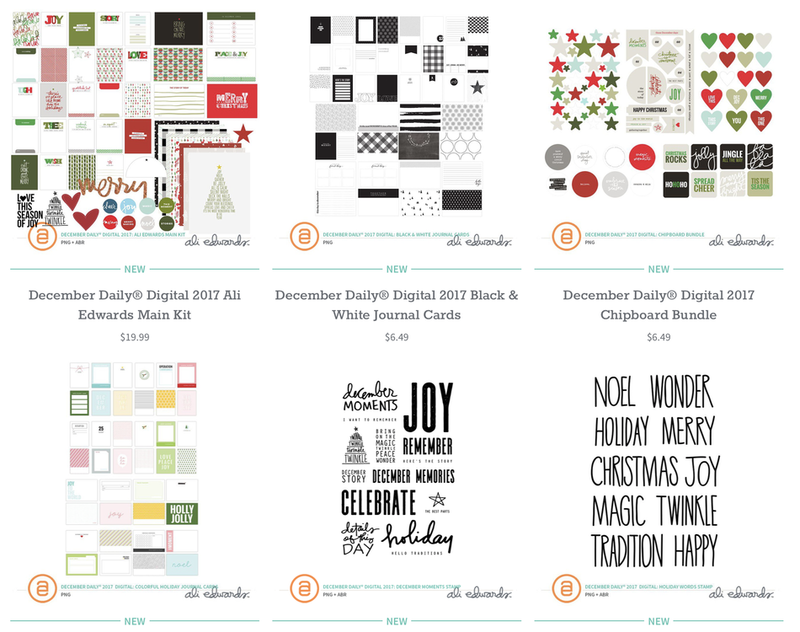 Join either my December Daily® Product Play 2, December Daily® Product Play or my Storytelling With December Daily® workshops and get immediate access to all the content. Review my past December Daily® blog posts. Follow @decemberdaily on Instagram (this is a different account than last year). You can also follow me @aliedwards or my main business account @aliedwardsdesigninc. Join the December Daily® Facebook group. Read my 25 Ideas And Story Inspirations. I am so excited and overwhelmed. Thank you so much for the links and I will check them out for sure. Wishing you and your amazing family a wonderful december. I am so excited to start my DD, this would be my second one, after years of failure. My hopes are high because I really want to do it and finish it. Thank you for sharing your knowledge with us.